We have a winner for Mary Brown’s Goldwork Embroidery: Designs & Projects! Goldwork Embroidery: Designs & Projects is a technique and project book chockfull of beautiful goldwork embroidery projects and instructional material. If you’re interested in goldwork, it’ll make a nice addition to your stitching library! …But I’m all for beautiful things that sparkle and I read in your review that there are a 100 pages devoted to projects and that sounds terrific! I like the look of goldwork, but I haven’t made a project yet. I recently bought a little introductory kit to Metalwork from The Royal School of Needlework stand while they were in Zwolle. It contains Gold Pearl Purl, Silver Wire Check Purl and Silver Rough Purl. When opening it was the first time that I ever really saw these ” treads”, I couldn’t believe how tiny and shiny they were. I haven’t started this project yet, but it is on the top of my to do list. I do fear it a bit, what I fear is that when I will cut the ” tread” it will go wrong so that I will spill it and are left with all kind of peaces that I cannot use. I may sound silly, but thats how I feel. Congratulations, Sabrina! Drop me a line with your mailing address, and this will be on its way to you soon! Lots more book give-aways coming up in the future, including some beautiful Helen Stevens books, another excellent goldwork book, the A-Z of Threadpainting, and others – so keep an eye out! 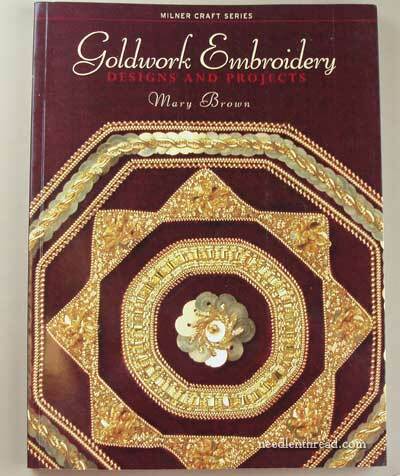 March 22, 2012 Goldwork Embroidery by Mary Brown – Book Give-Away! May 29, 2012 Beginner’s Guide to Goldwork – Book Give-Away! Congratulations Sabrina! You will love this technique. Congrats Sabrina! You’re already several steps ahead of me. You have a small kit to try and you entered this giveaway. Like you, I have a great fondness for all things sparkly. I confess even many of my sweatshirts have sparkly bits on them. But I’ve only gone as far as using metallic filaments and braid on my stitching. You have the courage to try this and the book will help even more. Mostly, have fun! Congrats Sabrina! You’ve got yourself a golden ticket!! 🙂 Enjoy the wonders! And I hope you’ll make something lovely to share here on NeedlenThread! Yay Sabrina!!!! Like Mary said it is nice to see that you are interested in Goldwork and I think you truly deserve this book. I love the way Goldwork looks but it is like my unicorn. Not something I would try, now if we were talking about Crewel work, then I’m all ears ;). Again have fun with your beautiful book and thank you Mary for your great site! Thanks Mary for another terrific book raffle! Congratulations to Sabrina–with a Royal School kit & this book you are already on your way. Don’t worry about small leftover bits. They can be used (successfully!) as glittery chips–sort of like sewing on beads. Check Mary’s archives–surely there is something there to help you. Congratulations Sabrina!!!! So happy for you, do share when you’ve finished. I’d love to see how it comes out!! G’day Mary, Another happy ‘customer’. Good on you Mary…and congratulations Sabrina. Your comment easily points out the rightness of this book acquiring you. Some books are kindred spirits and you’ll find this one in kind. It will treat you well. I just received the book (my book, hihi) yesterday and I would like to say that I like it very very much! It’s full of beautiful projects and even better full of how to do them. Can’t wait to get started! Previous Previous post: Goldwork & Silk Medallion: On the Edge!